Country roads everywhere can have that very different feel to them. They are an invitation to slow down your speed, take the foot off the pedal and enjoy the scenery unfolding. The better option is of course to leave the car behind altogether and walk or cycle. 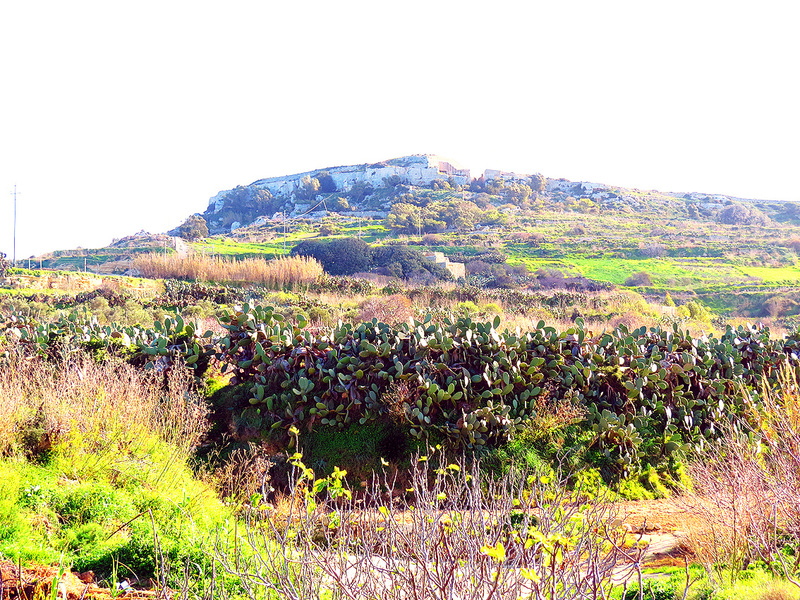 The quiet country road known as Tas-Santi is one such road and quite probably Malta’s most scenic too. At three and a half kilometres, it is not a longish road but what it might lack in length it compensates for with a kaleidoscope of magnificent views. 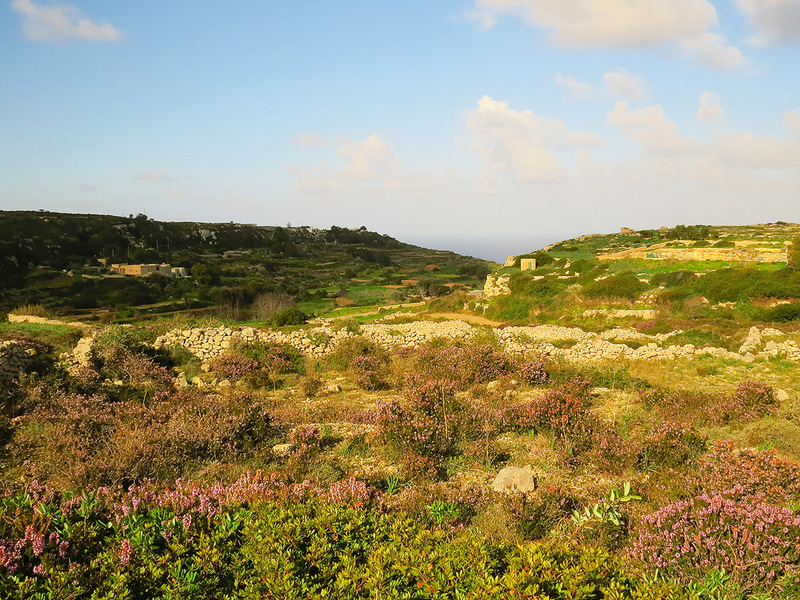 The road starts as an offshoot from the Rabat to Bahrija road (signposted Ghemieri, Gnejna) and goes all the way to the outskirts of Mgarr close to Gnejna Bay. The road starts with a straight stretch with a clutch of Erica bushes bordering its left hand side and then takes a left turn as it starts dipping from the heights of the Dwejra Ridge – a natural fault line along which the British built a defensive wall stretching some 15 km across the island around 1870. Fort Bingemma with its low outline (on the right of the road) is in fact the westernmost in a line of forts built along this wall. The road continues with the beautiful Santi Valley opening up to the left and more fields to the right with the occasional farmhouse thrown in. The views reach far from here: one can easily make out the Pellegrin promontory, Ghajn Tuffieha, and the Majjistral Park – and beyond the channel the white cliffs of Ta Cenc in Gozo. Halfway down the road there is the quiet hamlet of Santi consisting of just a couple of lanes and a few farmsteads. Hardly anything moves here and one’s passing is perhaps noted by a couple of barking dogs but little else. Past the hamlet the road continues its winding way at an easy gradient for another kilometre or so. To the right the quaint Palazzo Zammitello peeps over the fields and garigue. This is a country residence some three hundred years old, now catering for events and popular as a wedding venue. 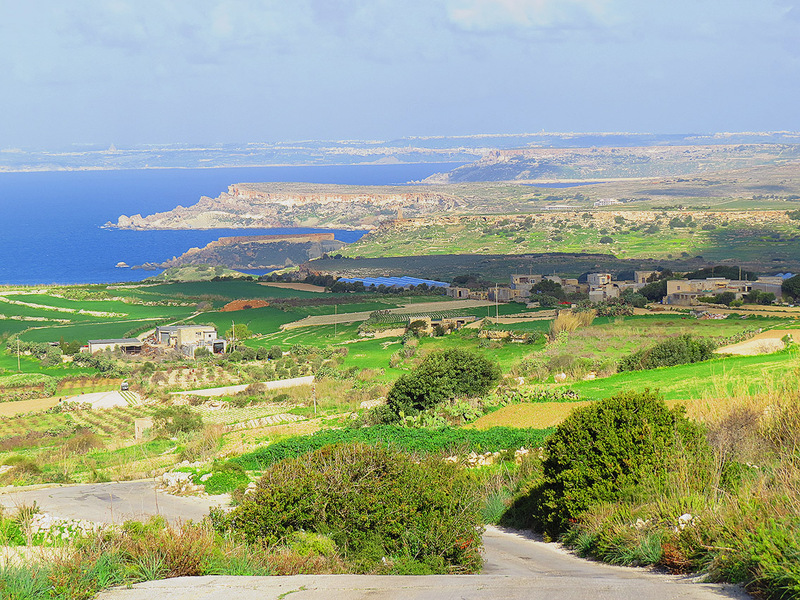 This lovely road soon comes to an end at a crossroads where one can choose to go either to the village of Mgarr or to the scenic bay at Gnejna. Going back the way you came to enjoy the views again is also an option!